The Tao of Stieb: Where Do We Go Now? 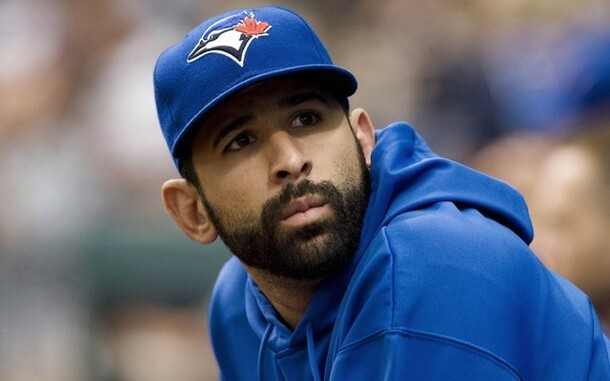 Sad Bautista is sad. We miss you too, buddy. Ear worms are fun, right? Those niggling little tunes that roll around in your head endlessly, drowning out all rational thought and subverting any attempts you might make at quiet contemplation. So fun. And really, they're more fun if you share them, so that others suffer the same way you do. Wanna suffer alongside your favourite online scribe? Read on, my friends. "Where do we go? Where do we go now? Where do we go?" That goes on in an endless cycle, with Axl's vocals getting increasingly desperate and whiny and screechy. And so while the song's lyrics seem to be pointing me towards a salient question, the off-key caterwauling drowns out any thought before it even has the chance to be formed. This is annoying. The truth is that I've pushed back on pondering the future of the franchise because I just want this season to play out. That's not to say that I'm holding out hope for the rag-tag band of survivors to pull together and miraculously make a run at the coin-flip game. But considering that I hear from the wiseacres and cynics every year starting in the winter that the Blue Jays are already out of contention, I just don't feel the need to place the wreath upon the stone until I absolutely have to. Once you give up on the season, you might as well put on your parka and start raking the lawn. I'm not ready for that quite yet. As a general impression, though, let me say this: I don't think that this team is that far off, but at the same time, I think that 2013 is going to present some real challenges. It would have been overly simplistic to assume that the path towards this high plain in the sun where the Jays contend every year was going to be direct and without obstacles. Injuries happen - do they ever - and can determine the fate of a franchise for several years. With a significant portion of the Jays' pitching talent in various stages of injury and recovery, next year's staff will likely need to be supplemented by some short term help from veteran free agents. And I hear some of you screaming: "YAHOO, WE'RE GETTING ZACH GREI-NER-KEY!" Slow up and climb down off that horse, hoss. That's pretty much the most unlikeliest of scenarios. And save your tantrums or your airing of frustration about the ownership. It's beneath you. If we're lucky, the veteran free agent talent that the Blue Jays bring in will be something along the lines of a number three starter. Someone who can pick up the slack should Ricky Romero repeat this year's underwhelming performance, and should they be faced with the prospect of yet another partial season from Brandon Morrow. In that context, pitchers like Edwin Jackson, Brandon McCarthy, Joe Saunders, or Anibal Sanchez might be considered a "good get", but all will likely command big salaries and multi-year deals. The next level down is a whole heap of wishes and prayers, and if you want to parse through the list and find hope, MLB Trade Rumo(u)rs has the full list of 2013 free agents right here. Have at 'er. The question, I suppose, will be if the Jays think that the acquisitions for 2013 will become superfluous in 2014 once the cavalcade of wounded arms comes marching back into action. I won't pretend to have an answer to that question, nor will I hazard a guess at what Alex Anthopoulos will do with it. Do we even know what Kyle Drabek or Drew Hutchison will have in the tank in 2014? And who will be part of the next shift of injured troops to be convalescing in that season? I'm told repeatedly that if the Blue Jays just got off their wallets and threw some money around, all of the question marks would become exclamation points. I really wish it were that easy. So where, in fact, do we go now? For now, let's just get through the rest of the season. It's going to be tough, I know, because this team that we're rooting for is nothing like the one we'd envisioned coming into the season. But let's not get bogged down there. Let's not suppose that the team we're seeing is much of a reflection of what we're supposed to be seeing, or what we might see next year. And let's not forget: Winter is coming. So let's smile while the sun still shines warmly on the last weeks of the season. I love the GoT reference! Go to the games. Then, in 5 years, you can tell your friends "I saw Anthony Gose and Adeiny Hechavarria before they were good!" Shaun Marcum is coming back to Pitch Like a Man. Book it. Sure, injuries have put a dark cloud on this season, but there are bright spots. Rasmus coming back to where a lot of ppl saw him years ago. EE becoming that big reliable bat in the 4 spot, and a pretty good 1b too. Janssen taking the closer reins. Darren Oliver is a shutdown beast. Certainly a lot of work to do in the off season for AA, and i'm hoping for more trading than free agents, as AA's reputation suggests. I've never been a fan of overpaying for mid tier talent. Love the cautious optimism. I wonder if Greinke is really out of contention. AA seems to have players he covets and he eventually gets them Greinke was one of those players. I agree that Ejax or McCarthy are more likely destinations. I think the lessen of this year is that we can never have too much talent, especially pitching. There will always be a market for pitching so why not sign a couple starters this off season? We don't know if Hutch or Drabek will come back. Or more importantly what they will come back as. So I don't see signing a MLB proven commodity as an issue given the trade opportunity. Next this team will need to target LF so as to extend the lineup. I can live with going on the cheap with Cooper aka Billy Butler light but they need to go out and get a LF with power and OBP if they go with Hech (2B) and Cooper (DH) next year. My dream is the Upton rumors This year were true like the Rasmus rumors were true a year before we got him. Imagine that line up. what we know is that, wither everyone healthy, this is probably an 85 win team. so where do we pick up the 10 wins it will take to be a perennial contender? "what we know is that, wither everyone healthy, this is probably an 85 win team. so where do we pick up the 10 wins it will take to be a perennial contender?" Well, given the increased parity around the league and the extra wildcard spot, perennial contender status can probably be achieved by being an 87-90 win team every year, not 95....if by contender you mean in a playoff race. Heck, just winning 85 games can put you in a wildcard race deep into September. We could get Marcum and League, and still keep Lawrie and Morrow! How cool would that be?